In 2014, the magic number was 3,554 – the number of regulations issued by executive branch agencies. These regulations cost American consumers and businesses about $2 trillion to comply. Small firms are often hit the hardest, with regulations costing businesses with less than 50 employees $11,724 per employee, but larger firms were still hit with about $9,000 per employee in regulation costs. Consumers feel overregulation in the higher costs of goods; the average household’s regulatory bill is approximately $15,000 each year, or one quarter of its income. Overregulation hits home especially for the metals industry. One recent example is a study by the Manhattan Institute that found the Environmental Protection Agency (EPA) overestimated the benefits of the Clean Power Plan (CPP) while underestimating the costs. Another example: The U.S. Supreme Court’s decision to allow implementation of the EPA’s new mercury pollution standards for power plants to go forward while legal challenges to it play out. Last June the U.S. Supreme Court did agree in a 5-4 decision that the EPA had not considered the cost of implementing the rule when writing it. As The Hill explains, “At a $9.6 billion projected annual cost, the mercury rule is one of the most expensive from the Obama administration” and it has “been blamed for the shutdowns of hundreds of coal-fired power plants.” Fewer power plants means more costly electricity for businesses and families alike. 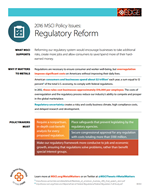 MSCI is fighting these regulations and others as part of its advocacy efforts. To learn more, read MSCI’s advocacy newsletter, Connecting the Dots. Contact your representatives and share how regulation reform can make the metals industry more competitive and provide more jobs.